Tees Valley Target Sports is a properly constituted Home Office approved target shooting club affiliated to all the principal national target sports organisations. It is also a registered Community Amateur Sports Club which confers rights and privileges similar to those enjoyed by registered charities but without the administrative burden. Current membership stands at 230 mainly from the Districts of Stockton, Redcar & Cleveland and Middlesbrough but we have members covering an area from Whitby to Sunderland. Tees Valley Target Sports Club (previously known as Guisborough Gun Club) in its present form dates from 1963 and occupies a former Home Guard open air range in East Cleveland. Whilst the outdoor facility satisfies basic requirements it is seriously deficient from the viewpoint of pedestrian/disabled access and parking; it is extremely vulnerable to adverse weather conditions. We have now opened an indoor facility on Teesside which will also caters for air rifle, air pistol, and indoor archery. We hold a limited number of open days during the year, visitors may only attend by prior arrangement (this is due to Home Office regulations and insurance conditions). 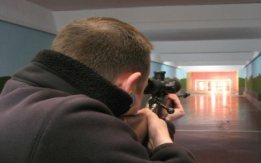 Prospective members can also be introduced by existing members at other times but are not allowed to shoot; we are unable to operate a day membership scheme.